Fortis is a leading utility company in North America with 97% regulated utility assets. The company engages in regulated power generation, electric transmission, and energy distribution across North America. The company operates through regulated independent electric transmission (30% of earnings), regulated US electric & gas (48%), regulated Canadian & Caribbean electric & gas (18%), and non-regulated energy infrastructure (4%) business segments. More than 90% of its earnings are from regulated utilities. By asset type, Fortis’ assets can be divided into electric (81% of asset mix), gas (16%), and non-regulated energy infrastructure (3%). The US accounts for about 60% of Fortis’ business while Canada constitutes the remaining 40%. The company serves utility customers in five Canadian provinces, nine U.S. states and three Caribbean countries. Fortis operates through 10 utility companies such as ITC, UNS Energy, Fortis Alberta, Fortis BC etc. Fortis is known for its highly regulated, low risk and diversified utility businesses, with more than 90% of its earnings coming from regulated sources. Fortis’ earnings are primarily determined under the cost of service regulation, in combination with performance based rate in certain jurisdictions. Through more than a century’s old existence, Fortis has developed an extensive infrastructure to deliver cost effective energy to homes and businesses throughout North America. Most of its businesses are leaders in the jurisdictions they serve. Fortis caters to over three million utility customers (2 million electric utility customers and 1.2 million gas utility customers) across North America. The company is known for providing safe, reliable and cost-effective energy services. Given its long experience with utility customers, Fortis is in a good position to address the changing customer needs e.g. customized service offerings and more real-time, digital communications, by leveraging new technology. Fortis is growing both organically and through acquisitions. The company has more than doubled its size with the successful acquisitions of three regulated utilities in the US, over the last five years. It continues to expand and diversify through investment opportunities in infrastructure, renewable power and strategic acquisitions. Fortis’ utilities have an ongoing capital requirement to fund maintenance and expansion of infrastructure. Given its consolidated long-term capital structure, the company enjoys investment grade credit ratings from top rating agencies which also grants it easy access to funds. Its $17 billion five year capital program is well funded and should boost future cash flow. The company is well positioned to leverage its operating expertise and financial strength to benefit from growth opportunities. Fortis is a Canadian Dividend Aristocrat and a Dividend Achiever having increased its dividends for the last 45 consecutive years. The company has a solid track record of superior shareholder returns. Fortis sports an attractive yield of 3.8%. It last raised its dividend by 5.8% and has compounded its dividend growth by more than 7% in the last decade. Fortis is planning to grow its dividends by 6% annually through 2023. It has been successful in reducing its payout ratio from 73% to nearly 64% over the last decade while growing its EPS at 8% CAGR over the last five years. The company expects long-term sustainable 6%-7% rate base growth to support dividend in the future and has registered a rate base CAGR of 7% in the last five years. Utility business is a stable business which is very immune to the vagaries of economic fluctuations and continues to generate secure cash flow. More than 90% regulated asset base ensures stable and predictable earnings for Fortis. Ownership of an extensive asset base, a large distribution network, and diversified and regulated utilities form a strong moat around Fortis’ business. Moreover, its utility business is subject to stringent regulations which also act as a strong entry barrier for newcomers. Strong regulated businesses provide enough stability to cash flow which is important for dividend growth. Fortis competes with several utility companies having a huge presence in the US and Canada. Emera Inc. TSE:EMA is a leading North American diversified energy and services company with assets worth $30 billion. Other large competitors are Brookfield Infrastructure Partners TSE:BIP.UN and Canadian Utilities TSE:CU, a subsidiary of ATCO TSE:ACO.X. Canadian Utilities is one of the biggest utilities in Canada, with more than 90% regulated earnings. Algonquin Power & Utilities TSE:AQN is another diversified generation, transmission and distribution utility based in North America. Utility stocks offer a safe haven, especially during turbulent times. 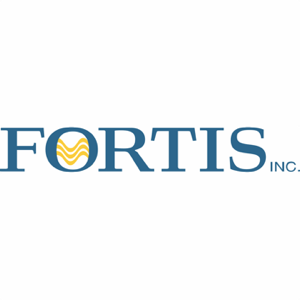 Fortis is a well-diversified, regulated, utility business characterized by low-risk and predictable earnings. As a North American leader in the regulated gas and electric utility industry, Fortis is favorably placed for multiple growth opportunities at hand. I prefer utilities over REITs as a safe investment for my portfolio. Emera and Fortis are my go to utilities at the moment.